The second part of Series 7 of Doctor Who, which is also referred to as Series 7B, has been said by some to be a “love letter” to Classic Doctor Who. Resplendent with obscure references to Who’s 50 year history, the Eleventh Doctor’s final complete season also contained “shout outs” to the Second Doctor’s tenure. Together with the re-appearance of the Great Intelligence after a 44 year absence and the Ice Warriors following a 39 year hiatus, Series 7 also made reference to the mysterious HADS, the Hostile Action Displacement System. In the same episode that heralded the Ice Warrior’s return, the TARDIS dematerialized from a sinking submarine in the South Pole to the North Pole (Cold War). When functioning correctly the HADS dematerializes the TARDIS to a close-by location when it is under external attack. It needs to be manually set, however, and the Doctor usually forgets to set it. 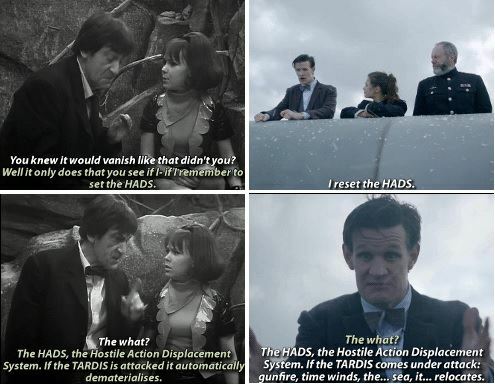 The first and only on-screen reference to HADS prior to Cold War was in the 1968-1969 serial, The Krotons. In that instance the TARDIS relocated several metres up a hill after being attacked by Krotons. 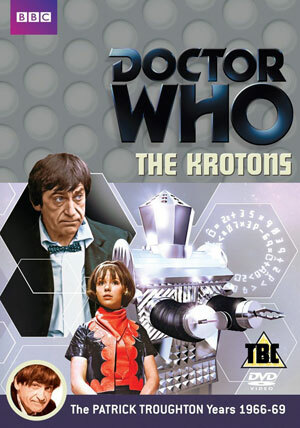 That a story as humble and lowly regarded as The Krotons should be alluded to more than four decades later is a testament to the high regard in which the Patrick Troughton era is generally held. Even “bad” Troughton stories have their redeeming features, not least of which is the very presence of the Second Doctor himself. Troughton has some charming scenes in this story including his classic encounter with the Kroton’s intelligence testing machine. As seen in the clip below, the Doctor decides to take the test after Zoe accidently completes it and receives a score twice as high as the Gonds’ previous best students. “Zo-Gond” (Zoe) is chosen to be a Companion of the Krotons and the Doctor won’t allow her to enter the Kroton’s Ship, the Dynatrope, alone. Easily flustered, the Doctor has difficulties at the commencement of the test which precipitates a wonderful banter between the pair. After assisting the Doctor to put on his headset and press the correct button, the Doctor barks at Zoe, “All right, there’s no need to shout! Now go away and don’t fuss me. No, come back. What’s this? It’s all right, I know. Right, fire away, I’m ready”. Great Jumping Gobstoppers, The Krotons. 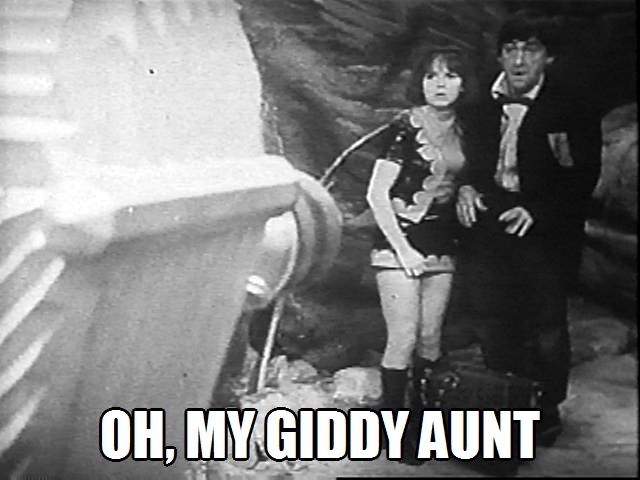 “Oh, my giddy aunt” is one of the better known Second Doctor’s expressions, however it’s in The Krotons that it makes its debut – less than six months before the end of Troughton’s tenure. As shown in the video posted, “great jumping gobstoppers” is also a lovely Troughtonism. Zoe’s extraordinarily high intelligence is remarked upon several times in The Krotons. She tells Selris that the “Doctor’s almost as clever as I am” whilst earlier the Doctor had said to him, “Yes, well, Zoe is something of a genius. Of course it can be very irritating at times”. The Doctor, however, is never seriously concerned by Zoe’s brilliance. There’s no sense of threat and never a suggestion that her intellect is unbecoming of a young woman. Similarly, the Doctor is not dismissive of Jamie, notwithstanding his apparent dimness. What Jamie lacks in schooling and cultivation he more than compensates for in gut instinct and cunning. The Doctor is equally as accepting of both his companions. I have little doubt that if I’d watched Zoe as an impressionable young girl then she’d have been my heroine. Able to complete any mathematical task better than a male and even the Doctor on occasion, Zoe had intellect in abundance and was gorgeous to boot. If I was 6” shorter, numerous kilos lighter and a few decades younger, playing Zoe would be my ultimate Cosplay ambition! The Third Doctor’s first companion, Liz Shaw, continued and expanded upon Zoe’s keen intellect and abilities, although her tenure was regrettably cut short. I will extrapolate upon this when Season Seven in reached. 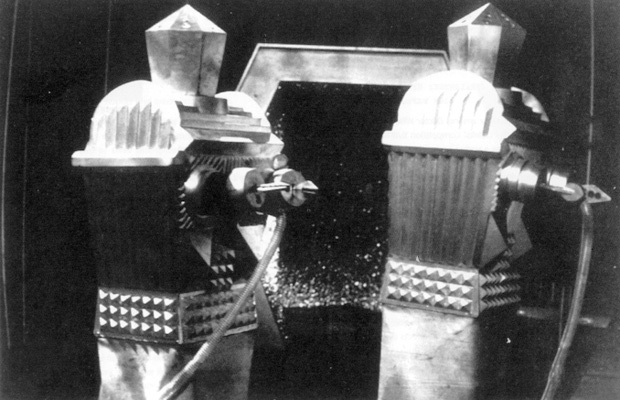 The moral that I took from The Krotons were the dangers of indoctrination and limitations to free scientific enquiry. The Gonds had been in a state of self-perpetuating slavery to the Krotons for thousands of years. They were educated by machines created by the Krotons and forbidden to study chemistry. As the Doctor noted, there were tremendous gaps in the Gonds’ knowledge. He asked why the Gonds had never thought to question why the prohibition on chemistry existed. That people would be educated by machines in the future was a prediction considered several times in 1960’s Doctor Who. 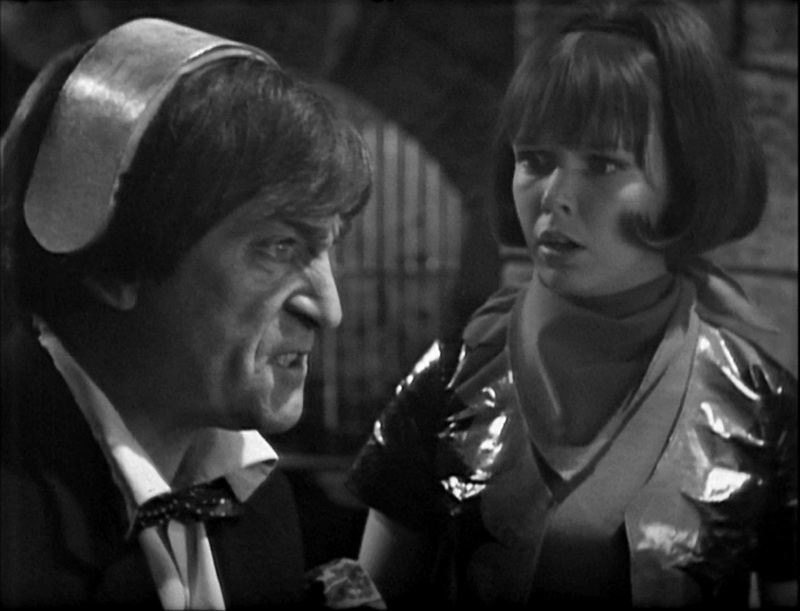 The First Doctor’s companion Vicki, an orphan from the 25th Century, had been educated for only one hour a week on machines and considered the History teacher Barbara’s 1963 curriculum to be infantile. The manner of Zoe’s education is unclear, however as a product of City’s Educational institution she, like the Krotons, had enormous gaps in her knowledge. Whilst able to undertake mental calculations in a second, she was bereft of social skills. The 1960’s fear of educational indoctrination would most certainly have had its genesis in the Nazi’s brainwashing of the German people. Technophobia is also likely to have been influential. Distain for computers was evident in The War Machines and The Invasion. In the latter the Doctor loudly proclaimed his hatred for computers on several occasions. The Luddite-like smashing of the Kroton’s educational machines by a group of Gonds further evidences this fear of technology. The growing awareness of South African apartheid, in which the minority whites enslaved the black population, could also have influenced Robert Holmes in the writing of this story. On the suggestion of Roy Skelton, he and Patrick Tull voiced the Krotons with a slightly South African inflection. Yet another attempt at a Dalek replacement, the Krotons were a poor substitute. 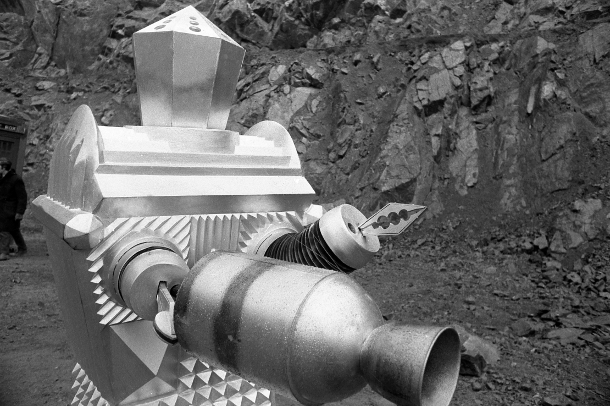 With arms that looked like the robot’s from Lost in Space, the Krotons were disabled by their strange and inflexible metal hands. Possessed of a rather cool spinning head, the poor Krotons were not so lucky with that part of their costume below the waist. A rubber skirt was merely tacked on to disguise the operators’ legs. The concept behind the Kroton’s creation was rather more interesting. Crystalline beings, the Krotons survive in their space-craft, the Dynatrope, in suspended animation in a form of slurry. To reconstitute themselves they must absorb sufficient mental energy. It is for this reason that every year they have taken the best two Gond students, drained them of their mental powers, and then killed them. 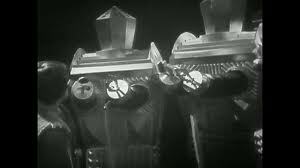 Rather than exterminating them as the Daleks do, the Krotons “disperse” them in a process in which the victim in essence disintegrates. 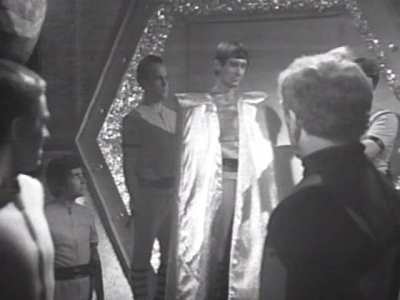 Join me for my next review when the Ice Warriors return in their second adventure, The Seeds of Death. Our time with Patrick Troughton is fast coming to an end.